In our past blog series, we talked a lot about new hot apps going through rounds of funding, or apps popular among certain age groups or regions. Sometimes, these apps are highlighted in tech media because they follow a noticeable digital trend: for example, apps such as Emojiary or Emoji.li that incorporated emoticons as their primary mode of communication. Other apps we love talking about are the off-kilter kind, which take the familiar user experience and turn it on its head, by limiting all communication to a single word (like Yo, or, if you’re a Game of Thrones fan, the Hodor app), or gamifying your video conversations (the way the Sup app does). 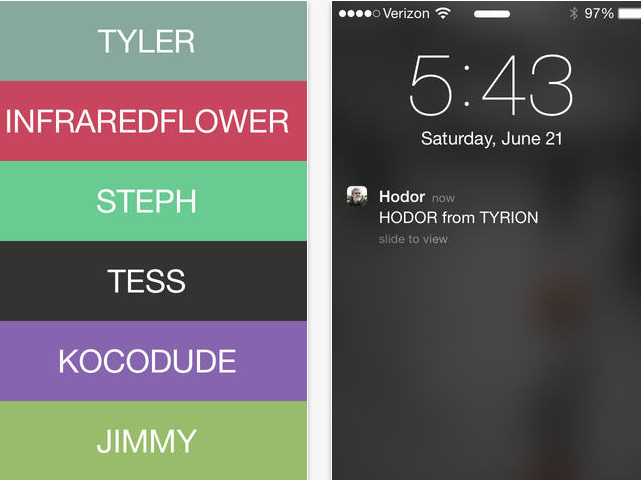 How many of us will still be Yo-ing or Hodor-ing our friends in August? What about in August, 2015? A gimmick app is still an app, with a purpose and a structure. While many of these apps start as a practical joke, they can also turn into real social networks, depending on the drive, ingenuity and flexibility of their founders. Turns out we don’t have to wait until August 2015 to see if Yo will start taking itself seriously. The app made headlines over the past week for launching the Yo Store, an in-app service that offers alerts from over 150 services such as BuzzFeed, MTV, and NBA, delivered straight to your lock screen free of charge. Users can set up custom alerts that will let the app ping you popular articles, tips about nearby places to visit in a certain location (sound familiar? ), or current bitcoin prices. And, of course, all these alerts will come in form of a “Yo” on your smartphone screen. Yo’s drastic function change from a gimmick to a multipurpose content delivery system is reminiscent of another recent release, Snapchat’s Discover feature. Snapchat itself has transformed from a gimmicky app into a content delivery platfrom—the difference between Snaps and Yos is that the transition in the former case was a lot less sudden. The ephemeral video app’s popularity among the younger generation has had marketers racking their brains over possible uses of Snapchat for business. Discover offers many kinds of content creators a new outlet to help their work reach what in many cases is a brand new audience. Josh Constine of TechCrunch describes this messenger app-turned-content platform development as mobile messaging apps becoming centralized portals for information. In July, we speculated about the possibility of Tinder becoming a legitimate social network, wondering if “[m]aybe at conferences in 2016, we’ll swipe right to connect with networking targets.” While there are no signs of this transition happening any time soon, we’re seeing more apps with similar user experience rolling out to the app stores. Tinder has inspired developers to build apps where users can swipe right on anything from job applicants to cute pets. Thus, while Tinder itself hasn’t become the essential tool for content marketers we hypothesised, the app has popularized the trend on the swipe-based UX. All this doesn’t mean that content marketers should be frantically coming up with a strategy to incorporate BuzzFeed’s Cute or Not app. What Yo does show us, however, is that apps built in a day, or as little as 8 hours of the developers’ time, still possess the power of leading trends for the future user experience. Whether or not collections of apps on our smartphones are soon to be replaced by the single Yo Store, it’s useful for both the digital marketer and the consumer to keep a keen eye out for new disruptive capabilities in apps, no matter how niche or gimmicky they may seem. After all, today’s gimmick may predict the UX of tomorrow’s hottest social platform.